3200-2800 BC Early Cycladic Art. 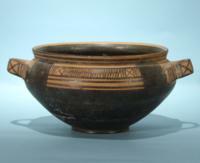 2800-1900 BC End of the Neolithic Period, beginning of the Greek Bronze Age. 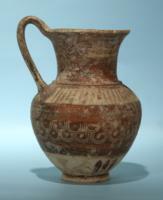 2000-1600 BC Growth of Minoan civilization in Crete. Palace of Knossos. 1600-1400 BC Zenith of Mycenaean civilization. Ca. 1400 BC Sack of Knossos, Mycenaean dominance, linear script. Ca. 1225 BC Achaean Greeks appear in Egyptian records. Ca. 1200 BC Approximate date of the Trojan War. 1200-900 BC Great migrations, the Dorian invasion, fortified settlements, the Greek Dark Ages. Ca. 900 BC First Greek trading settlements in Syria. Ca. 800 BC Greek settlements in Southern Italy and Sicily. 776 BC Traditional date of the first Olympic Games. 730-710 BC Spartan conquest of Messenia and Laconia. Ca. 700 BC Homer composes the Iliad and the Odyssey. Tyrannies in Greek city-states. Ca. 650 BC The first coinage, Lydia. First Greek settlement in Southern Russia. 621 BC Draco the lawgiver in Athens. Ca. 600 BC Persia conquers Lydia. Reforms of Solon, and Kleisthenes democracy in Athens. 582 BC Foundation of Akragas in Sicily. 560-546 BC The reign of Kroesos, Lydia. 545-510 BC Tyranny of Peisistratus in Athens. 525 BC The Siphnian treasury at Delphi constructed. 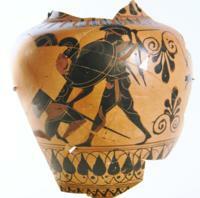 550-480 BC Attic black-figure vase painting in Athens. 499 BC Persians attack Naxos. 490 BC 490 - Battle of Marathon. Persian invasion of Greece under Darius. 480-479 BC Persian invasion of Greece under Xerxes. Battles of Thermopylae and Salamis. Battle of Plataea. Athens sacked by Persia. 480 BC Greeks defeat Carthaginians at Himera. Ca. 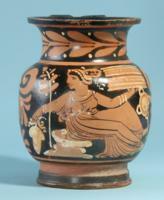 480-400 BC Attic red-figure vase painting in Athens. 477 BC Delian league formed for the defense of Greece, later becomes the Athenian Empire. 474 BC Italian Greeks defeat the Etruscans at Cumae. 454 BC Delian league treasury transferred from Delos to Athens. 454-413 BC Perdikkas II of Macedon. 450-400 BC Aeschylus, Sophocles, Euripides, Perikles. The Parthenon built. Temple of Zeus at Olympia built. 431-404 BC The Peloponnesian War between Athens and Sparta. 425 BC The Nike by Paionios of Mende at Olympia. 413 BC Athens defeat at Syracuse. 404 BC Spartan victory over Athens. 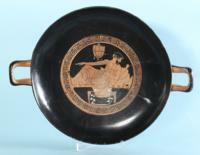 404-386 BC The hegemony of Sparta. Ca. 400 BC Aristophanes, Thuycidides, Plato. 375 360 BC Temple of Asclepius and Theater at Epidauros built. 371 BC Battle of Leuctra, Theban hegemony begins. 356 BC Birth of Alexander at Pella. Ca. 350 BC Demosthenes writes first 'Philippic'. Carthage active in Sicily against Timoleon and Dionysius of Syracuse. 343 BC Aristotle goes to Macedon to become Alexander's tutor. 338 BC Macedonians under Philip II defeat Greeks at Chaeronea (August 2). 336 BC Philip II murdered, Alexander assumes title of hegemon and strategos of the Corinthian League. 334 BC Alexander invades Persia, Battle of Granicus River. 332 BC Alexander beseiges Tyre. 331 BC Foundation of Alexandria in Egypt. Battle of Gaugemela Alexander defeats Darius. 330 BC Persepolis sacked and occupied by the Macedonians. Ca. 330 BC Lysippos and Praxiteles flourish. 326 BC Alexander defeats Porus in India. 323 BC June 10, Alexander dies in Babylon. 300 BC Antioch founded by Seleucus I. Ptolemies rule Alexandria, Egypt. Attalids rule Pergamon, Asia Minor. Ca. 280 BC Gauls invade Asia Minor and Greece, sack Delphi. 275-216 BC Heiron II rules at Syracuse. 197 BC Rome defeats Macedon. Ca. 180 BC Great Altar of Pergamon constructed. 146 BC Corinth sacked by Rome. 133 BC Kingdom of Pergamon bequethed toRome. 86 BC Romans under Sulla, sack Athens. 36-32 BC Antony in Alexandria, marries Cleopatra VII. 31 BC Octavian defeats Antony and Cleopatra at Actium, end of the Ptolemaic kingdom.